The leaders of Papua New Guinea, Solomon Islands and Vanuatu have given their full backing to an attempt to have Fiji's suspension from the Pacific Islands Forum lifted. Fiji's military leader Frank Bainimarama secured their support at a meeting in Port Vila. At a news conference the chairman of the group, Vanuatu's Prime Minister Edward Natapei, said the leaders praised Commodore Bainimarama's strategic framework for change for Fiji as reflecting a clear vision to achieve sustainable democracy. That strategic framework would see Commodore Bainimarama stay in power for at least another five years without elections. 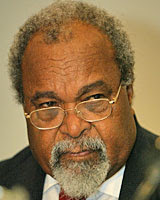 Papua New Guinea's Prime Minister, Sir Michael Somare (pictured above), said he had been convinced that some of Commodore Bainimarama's plans were good for Fiji. The Melanesian countries say they will take Fiji's case for withdrawing its suspension from the Pacific Islands Forum to next month's leaders' meeting in Cairns. Bunch of puppets, they are, how can they not see what the ordinary Fiji people are feeling & seeing. Whats wrong with Michel Somare & his mates???? If Fiji is brought back, I hope Australia withdraws permanently from the forum and the region. It just shows how dumb the Melanesians are. The melanesian countries and their leaders are in the same boat as Fiji-bunch of dumbos who take things for granted. How can they accept what Frank had told them without any idea at all of how the people of Fiji feel about this whole affair? Are they also scared of Frank and his rebellious soldiers? I am ashamed to be called a Melanesian! I wonder how these countries would react if they themselves had their government removed by their military (para or otherwise) or police force. All of them have very short memories. Their support is unbelievable and I can only think that Frank has threatened to invade them if they dont tow the line.. The people of Fiji want a democratically elected Government, independent judiciary, freedom of speech, upholding of our human rights and a free an independent media. The majority of people who call Fiji home do not want Bainimarama and his bunch of crooks. The Melaenesian Leaders are not helping Fijians by supporting Bainiamrama as we do not want him and blood will also be on your hands as the people of Fiji remove him forcefully. Somare is not a leader! He is just a bushman and the Queen should remove his knighthood! He does not deserve it. Talk about follow the leader blindly! Solomon Is, Vanuatu and PNG have once again betrayed the people of Fiji! Why can't they talk to the people on the street before supporting a dictator like Frank? Bloody bunch of nitwits!